How to Configure Band Steering on TP-Link Omada Controller? As we know, some wireless clients can only work on 2.4GHz band while dual-band wireless clients can work on both 2.4GHz and 5GHz bands. So if both single-band and dual-band clients are connected to 2.4GHz wireless network, 2.4GHz wireless network will be overloaded while 5GHz wireless network is relatively free. Band steering function can avoid this kind of waste by leading dual-band clients to connect to 5GHz wireless network with higher priority. A newly-added dual-band client is trying to connect to the wireless network “TP-LINK”. Because most clients (single-band or dual-band) are tend to 2.4GHz wireless network which is normally more crowded than 5GHz wireless network like the topology shown above. At this time, we can enable Band Steering function to guide newly-added client to connect to 5GHz wireless network with higher priority. 5GHz Maximum Connection Threshold means the “maximum number of clients that can be connected to EAP’s 5GHz wireless network in priority”. In this instance, we set it as “20”, which means Band Steering function will guide the first 20 dual-band clients to connect to EAP’s 5GHz wireless network in priority. If it reaches the limitation, it means EAP already has many clients connected to its 5GHz wireless network. 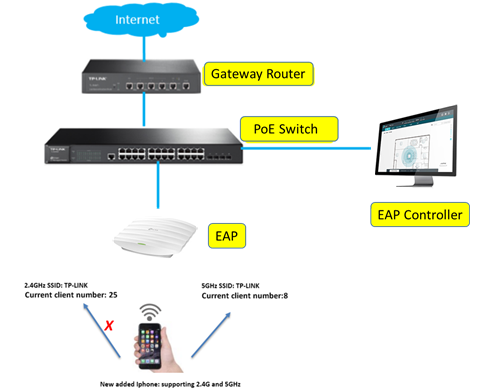 At this time, there may be no need to guide newly-added client to connect to EAP’s 5GHz wireless network any more. Difference Threshold means the “minimum client number difference between 2.4GHz and 5GHz wireless networks”. In this instance, we set it as “4”, which means if the client number difference between 2.4GHz and 5GHz wireless networks is larger than 4, 2.4GHz wireless network may be idler than 5GHz wireless network. At this time, there may be no need to guide newly-added client to connect to EAP’s 5GHz wireless network any more. In a word, Band Steering function will always guide newly-added clients to connect to EAP’s 5GHz wireless network in priority. But if 5GHz Maximum Connection Threshold and Difference Threshold are both satisfied, there have been already many clients connected to EAP’s 5GHz wireless and 2.4GHz wireless network is idler than 5GHz wireless network. At this time, Band Steering will no more guide newly-added client to connect to EAP’s 5GHz wireless network. If a newly-added client has failed to get connected with EAP’s 5GHz wireless network for 10 times (Maximum Fail times), EAP’s 5GHz wireless network will accept this client’s connection request even if both 5GHz Maximum Connection Threshold and Difference Threshold are satisfied.